Gracie Mansion stands in Carl Schurz Park above Hell Gate, a roaring stretch of water where the Harlem and East Rivers meet. The Dutch West India Company deeded the land in 1646 to Sybout Claessen, who dubbed the jutting riverbank "Horn's Hook" in honor of his native village of Hoorn in Holland. The first house on the site was built around 1770 by Jacob Walton, a merchant and British Loyalist. Walton's house was seized by American rebels and all but destroyed. Archibald Gracie, a Scottish shipping magnate, bought the property in 1798 and built the mansion the following year; an addition was built in 1809. It remained his country retreat through 1823. Gracie, a prominent member of New York society, staged elegant parties that attracted Louis Philippe, later King of France; President John Quincy Adams; Washington Irving; and Rufus King, ambassador to Britain. But Gracie never recovered from debts to shipping embargoes and unpaid claims during the War of 1812. He had to dissolve his firm and liquidate his assets in 1823. Six years later he died. The Federal-style structure was built originally in 1799 by Gracie, and at the time was a country house several miles north of what was then considered the "city." According to Elliot Willensky and Norval White's great book, "The A.I.A. Guide to New York City, Fourth Edition," Three Rivers Press, 2000, the house's design is attributed to Erza Weeks. In 1823, Gracie sold the property to Joseph Foulke and in 1857 it was bought by Noah Wheaton. In the late 1880s, a sea wall and promenade were built along Hell Gate. The property was then condemned and seized by the City in 1896 and its 11-acre grounds were incorporated into the newly-formed Carl Schurz Park. For several years, the house was used as a concession stand and restrooms for the park until it was finally restored and became the first home of the Museum of the City of New York in 1924. 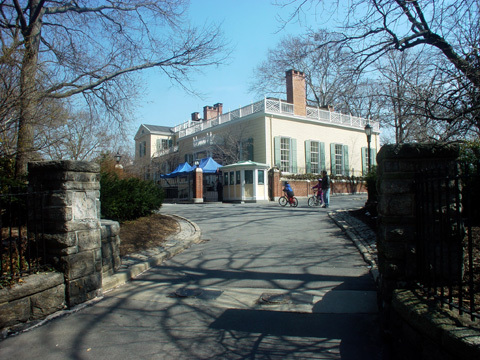 When that museum moved to new quarters on Fifth Avenue, Gracie Mansion became an historic house museum run by the city's Parks Department in 1936 and before long Parks Commissioner Robert Moses had it designated the official residence of the Mayor and in 1942 Mayor Fiorella H. LaGuardia moved into it. The house was enlarged in 1966 with the addition of the Susan E. Wagner Wing, which includes a grand ballroom and two intimate reception rooms. 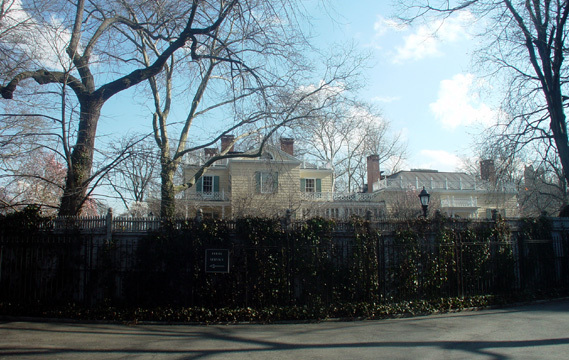 The Gracie Mansion Conservancy was established in 1981, and under its guidance, the first major restoration was undertaken between 1981 and 1984. In 2002, the interior and exterior were again restored, and the house was transformed into the "People's House" with increased accessibility to the public and to City agencies. It is also used to accommodate visiting officials and dignitaries, such as former guests First Lady Rosalynn Carter and President Nelson Mandela. The Gracie Mansion Conservancy is a private not-for-profit corporation established in 1981 to preserve, maintain and enhance Gracie Mansion - one of the oldest surviving wood structures in Manhattan and a member of The Historic House Trust. The Conservancy's mission is to raise funds to restore the historic structure and acquire furnishings that illustrate the rich history of New York; improve the surrounding landscape and gardens; and provide educational services, including publications and tours. For more information on tours, to volunteer or to help support the conservancy's activities, call 212-570-0985. The building is notable for its three-sided porch and for the trellis railings that sweep around the house at the second-story and attic levels. Gracie Mansion lies within Carl Schurz Park that is bounded by East End Avenue, the East River and 84th and 90th Streets. Carl Schurz (1829-1906) was a general, senator Secretary of the Interior and editor and was the famous German immigrant of the 19th Century. The park was created between 1876 and 1891 and reconstructed to accommodate the FDR Drive that runs beneath it. From the park's esplanade, one can see the Triborough Bridge, Randall's Island, Wards Island and the Hell Gate Bridge. The Gracie house was only one of several large houses in the area in the early 19th Century. John Jacob Astor had a residence at 88th Street and the Chauncey Livingston Manor was at 85th Street.